My son Cooper’s first birthday was a blast!! I know he’s not going to remember it, and didn’t really know what was going on, so yes, I do confess most of the stuff I did was so I could have something awesome to post on the blog, but I still fully support your decision to throw a party for your one year old! It was so much fun and so worth it! The crowning jewel of his birthday for me was his cake smash video. He may not remember his party but he’ll at least be able to watch this super cute video in the future and know how adorable he was!! Plus, his birthday is also a celebration of surviving my first year as a mother and I feel like this video pretty much sums that up as well! Cassie made the fabulous cake in his video. It was a banana cake because Cooper LOVES bananas and it seriously was the best!! You can click here for the recipe! For the party we went to Classic Fun Center because they have blow up toys and a play gym for the little kids, and an arcade for the adults older kids. I was a little worried it would be kind of weird with more adults than kids but everyone seemed to have a good time! 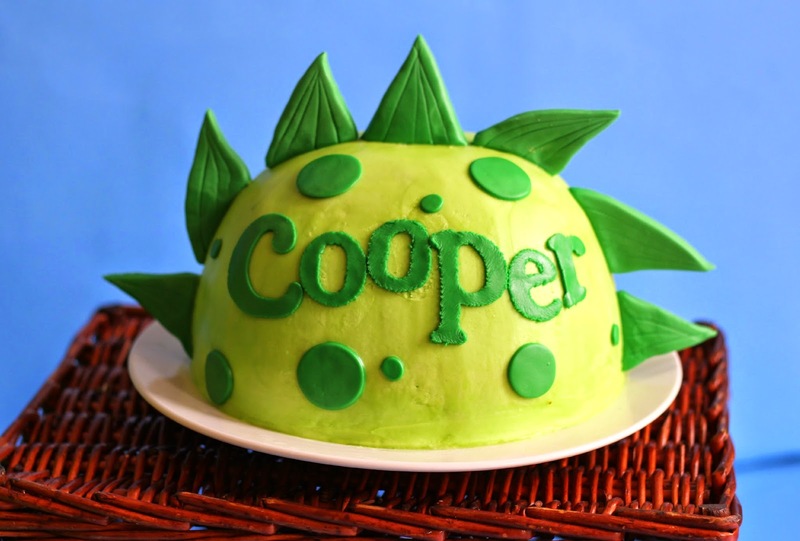 I decided to do a dinosaur theme because Cooper always growls like a dinosaur. I got most of my ideas from Celebrations at Home. They have a lot of really cool ideas so be sure to check them out! I made “Hot Lava” brownies that we served with ice cream since Cooper had already devoured his cake from Cassie. They are actually a Red Velvet Brownie Recipe that I got from Sally’s Baking Addiction. As you can see, they were definitely delicious! Besides all of the presents he got, Cooper was also spoiled with all the tickets that everyone won at the arcade! We got the kiddies some cool toys and Cooper a giant stuffed Dinosaur! I love this little kid!! Happy Birthday Cooper! Need more party ideas?? Check these out! What a cute little party idea! Haha, I love the cake & the brownies. Yum! Just discovered your blog from here! https://plus.google.com/u/0/communities/112774600138512768736 ! LOL! love the dino cake! My youngest, who is now 12 (argh!) was a huge dinosaur fan and also had a dinosaur cake to smash! It never gets old watching a kid realize he/she can grab that cake and no one will say no! Thanks for sharing the fun! Found you over at the #WeekendBloggyReading party. What a cute party! Can I have one of those brownies? They look amazing! I'm stopping by from the Totally Terrific Tuesday Link Party! I'm co-hosting this week with Jessica. Thanks so much for sharing and linking up this week! Thank you for sharing with us at Retro Repin! I chose to feature this great party idea this week and hope you stop by to link up again! This is so stinking cute! pinned, tweeted and stumbled! Thanks for linking up at Totally Terrific Tuesday! I just loved this idea. I am also thinking to use this theme in my son’s party. He wants to have a thrilling party so would look for the most suitable party venues for this Disney birthday party. Hopefully will be able to find one in my budget. What site did you use to make the invitations? I love love that and would like to use that for our sons first birthday! Love the poem on the invitations!! Where did you get them done? ?